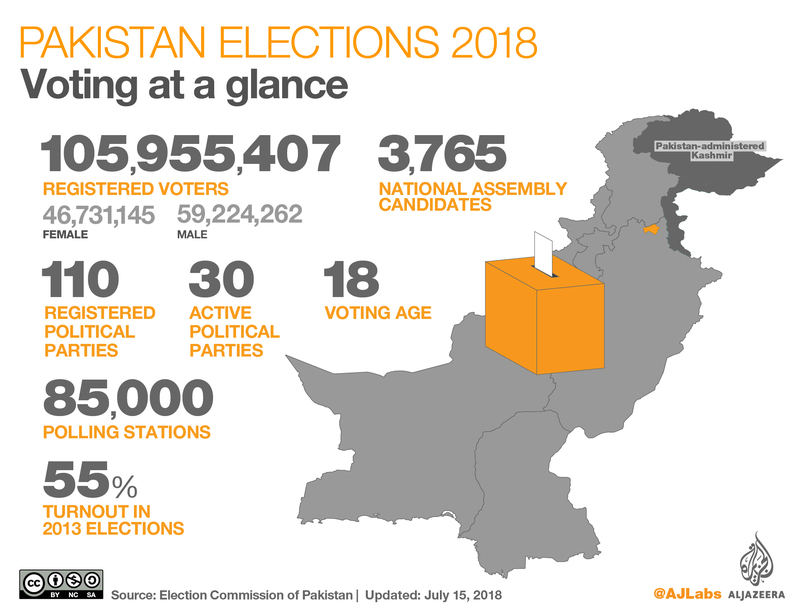 Millions of Pakistanis are flocking to polling stations to vote in the country’s parliamentary elections that will see the second civilian-to-civilian handover of power in its history. People began voting on Wednesday at 8am (03:00 GMT) to send 272 representatives to the National Assembly. Polls will close at 6pm (13:00 GMT) across 85,000 polling stations manned by up to 800,000 police and military forces. More than 30 political parties and 12,570 candidates are in the running to sway close to 106 million registered voters, who will elect both the national and four provincial assemblies. The opposition party Pakistan Tehreek-e-Insaf (PTI), led by cricketer-turned-politician Imran Khan, is looking to unseat the incumbent Pakistan Muslim League-Nawaz (PML-N), which was formally led by the now imprisoned ex-prime minister Nawaz Sharif. It’s only the second time in Pakistan’s history that a civilian government completed its term and handed over power to another one. Wednesday’s election will see 272 seats filled, forming the parliament in a first-past-the-post system. Each voter will cast two votes – one for the national assembly, another for the provincial assembly. Sixty seats are reserved for women and 10 for minorities, which are allotted on a basis of five percent proportional representation. Each assembly of the four provinces – Balochistan, Khyber Pakhtunkhwa, Punjab and Sindh – will elect representatives, who will, in turn, pick a chief minister. At least 24 people, including two policemen, have been killed and more than 20 wounded after an explosion near a polling station hit a police van in the southwestern city of Quetta. Waseem Baig, spokesperson for the Quetta civil hospital, confirmed the death toll to Al Jazeera from the blast in the eastern bypass area of Quetta. A shooting between supporters of two opposing political parties has left one person dead and wounded two people in a village near the northwestern city of Swabi, police said. Police officer Khalid Hamdani told Associated Press news agency it is unclear what triggered the shoot-out between a group of supporters of the secular Awami National Party (ANP), which has often been targeted by the Taliban, and the Pakistan Tehreek-e-Insaf (PTI) led by former cricket star Imran Khan, a centre-right party. Hamdani said the situation is now under control and voting is under way in Sher Khan village. We’ve already seen people turning up early here in Islamabad, so that they can get voting over with. Once they are inside there is a section for the ladies and a separate one for the gents. Voters will check for their names on the voters’ lists and if they are in the capital, they will get one ballot paper, but if they are in the provincial cities, they will get two ballot papers – a green one for choosing a representative in the parliament and a white one for choosing the provincial legislators. It is indeed a tough-fought election. There is still a lot at stake. All three mainstream political parties are saying that they are going to get a high number of votes and seats, but the people of Pakistan will make that ultimate decision. Been roaming the streets of Lahore’s NA125 constituency all morning. Seeing a slow, steady stream of voters, but no big crowds or lines. Compared to the by-poll here in September, voter numbers seem small, at least so far. In Lyari, where it seems to be still PPP dominant. Amna Bibi, 74, says she is voting for the PTI in Lahore’s NA-125 constituency, as she believes Imran Khan can bring change to Pakistan. Rabia Nusrat, 45, says she is voting for PML-N in Lahore’s NA-125 constituency because she believes party leader Nawaz Sharif – jailed for corruption earlier this month – has been unjustly convicted. 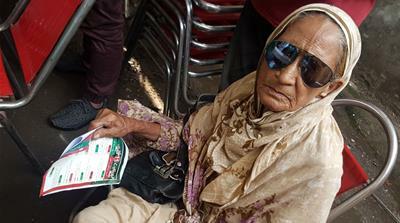 Shehbaz wasn’t the first voter in line at this polling station, though. That honour goes to Zafar Mehdi, a 73-year- old schoolteacher. Can Imran Khan’s Pakistan Tehreek-e-Insaf displace the dominant PML-N party of Nawaz Sharif from its political heartland of Punjab? If it does, it’ll have gone a long way towards securing the government. Read more here. 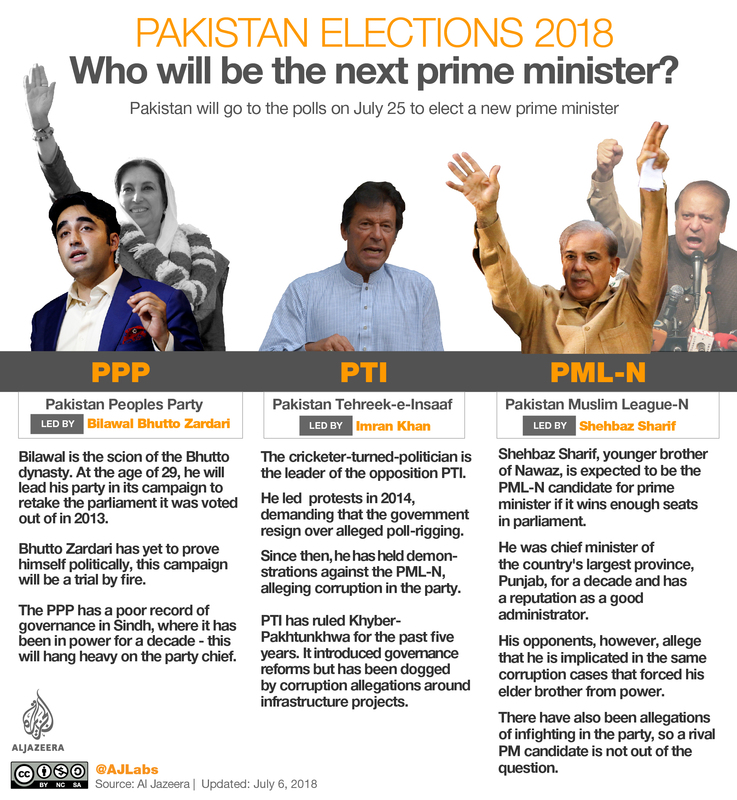 How will Pakistan’s slew of new far-right parties fare in actual voting? Will they be able to sway enough voters away from the mainstream parties to win a seat? More here. Pakistan’s northwestern tribal areas vote for the first time as part of directly-governed Pakistan after being merged with Khyber Pakhtunkhwa province earlier this year. Which way will the tribal areas – where a widespread rights movement has challenged the status quo – vote? In Karachi, Pakistan’s largest metropolis, the hold of the dominant Muttahida Qaumi Movement (MQM) party appears to have been broken by a sustained paramilitary operation that has targeted the party’s criminal enterprises. So, will the sprawling metropolis of more than 18 million still vote for MQM, or can other parties finally gain a foothold there for the first time in 30 years? Follow Al Jazeera’s reporters in Lahore, Karachi, Islamabad and elsewhere as we provide you reporting from on the ground throughout the day. Pakistani intelligence officials say attackers killed four troops escorting an election convoy in the volatile southwestern province of Balochistan. Two intelligence officials told The Associated Press the soldiers were escorting a convoy with election staffers and voting material on Tuesday in the district of Turbat when they came under attack. The officials say the assailants first fired rocket-propelled grenades as the convoy passed through the Niwano area, then shot at troops with automatic weapons. Three army soldiers and a member of the paramilitary force were killed. Thirteen people – eight soldiers, a member of the paramilitary force, and four civilians – were wounded. Both officials spoke on condition of anonymity because they were not authorised to speak to the media. Security has been stepped up in the country after a series of deadly attacks targeting candidates or campaign workers ahead of the polls. About 800,000 security personnel, including more than 370,000 army soldiers, are on duty to ensure security on election day, according to the Election Commission of Pakistan. The process of deploying troops across the country to conduct free, fair and transparent elections was completed on Tuesday, the government said on Twitter. “Voter turnout is expected to be high, but the security concerns are going to be paramount,” said Al Jazeera’s Kamal Hyder, reporting from the capital, Islamabad. Election material including ballot boxes, seals, polling booths, ink, ballot papers and other necessary items were delivered to polling stations countrywide on Tuesday. Around 1.6 million electoral staff are expected to be on duty on election day. Electioneering officially came to a close on Monday night, with all the major parties making one final push to convince voters. No public campaigning is allowed 24 hours before the polls open in Pakistan. PTI’s Khan held a series of rallies in the eastern city of Lahore, PML-N’s political heartland. 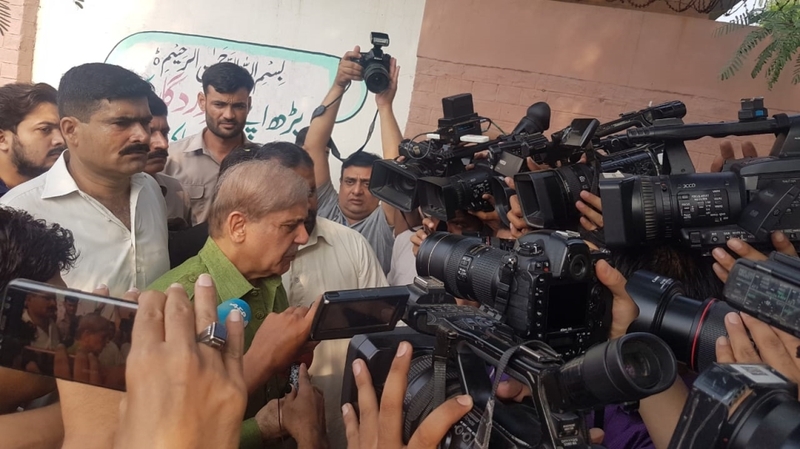 PML-N President Shehbaz Sharif also addressed a rally in the central town of Dera Ghazi Khan, Punjab, urging the nation to “give respect to the vote”, a party rallying cry that refers to their allegation that the military and judiciary have been interfering in the political process. On Monday, the Human Rights Commission of Pakistan (HRCP) said journalists in the country faced a sustained and concerted series of curbs, including disruptions and closures of the country’s top news organisations. “Overall, continuing intimidation and the perceived need to self-censor has severely hampered objective journalism,” the HRCP report said.